At the southern end of the Sound of Islay on the Jura side the ferry to Port Askaig passes a buoy with the label Black Rocks. The ‘wash’ behind it also nicely show the strong tidal flows in the sound, one of the reasons it was chosen as a site for a tidal power generation installation. Also note the Jura ferry on her way to Port Askaig in the distance. 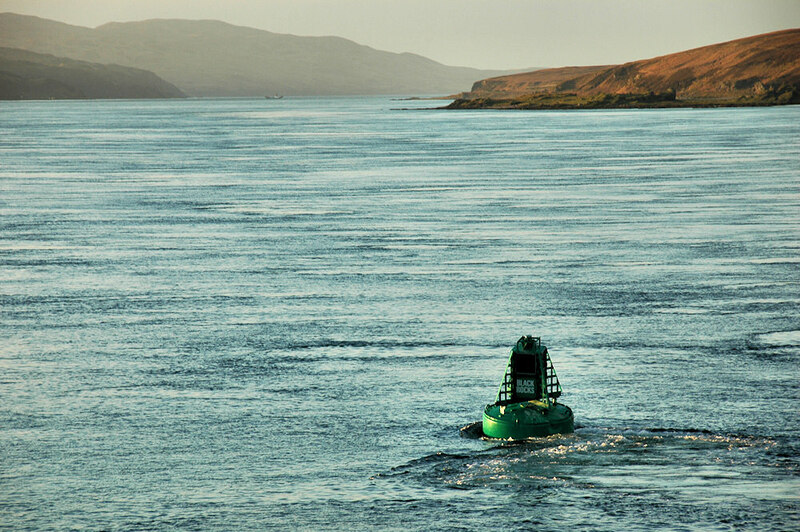 This entry was posted in Landscape, Repost, Sunny Weather and tagged buoy, ferry, Islay, Jura, Port Askaig, Sound of Islay by Armin Grewe. Bookmark the permalink.